The Boxer is a medium-sized, short-haired breed of dog, developed in Germany. The coat is smooth and tight-fitting; colors are fawn or brindled, with or without white markings, and white. 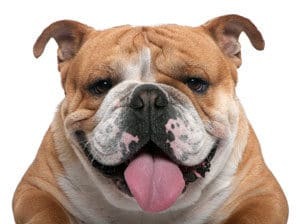 Boxers are brachycephalic (they have broad, short skulls), have a square muzzle, mandibular prognathism (an underbite), very strong jaws, and a powerful bite ideal for hanging on to large prey. 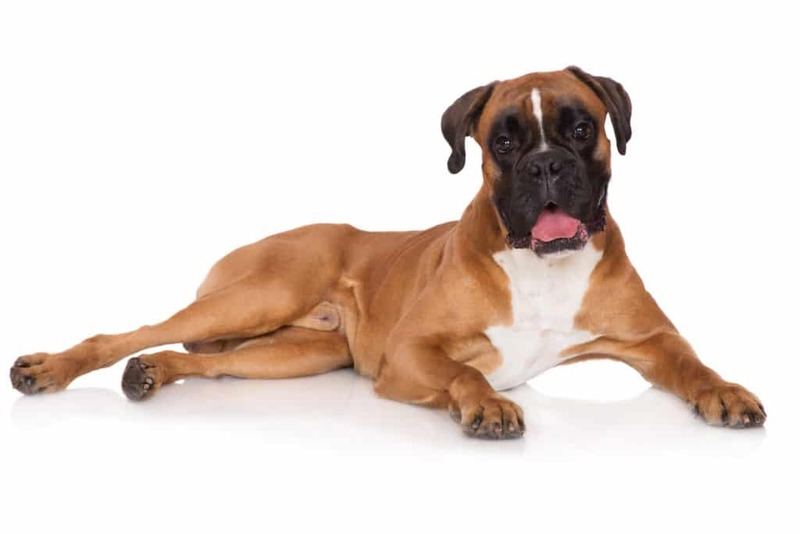 The Boxer was bred from the Old English Bulldog and the now extinct Bullenbeisser which became extinct by crossbreeding rather than by a decadence of the breed. The purpose of the crossbreeding was the wish to eliminate the excessive white color of the breed, and the necessity of producing thousands of dogs for one of the most popular breeds in the world. The Boxer is part of the Molosser group. This group is a category of solidly built, large dog breeds that all descend from the same common ancestor, the large shepherd dog known as a Molossus. The Boxer is a member of the Working Group. The head is the most distinctive feature of the Boxer. The breed standard dictates that it must be in perfect proportion to the body and above all it must never be too light. The greatest value is to be placed on the muzzle being of correct form and in absolute proportion to the skull. 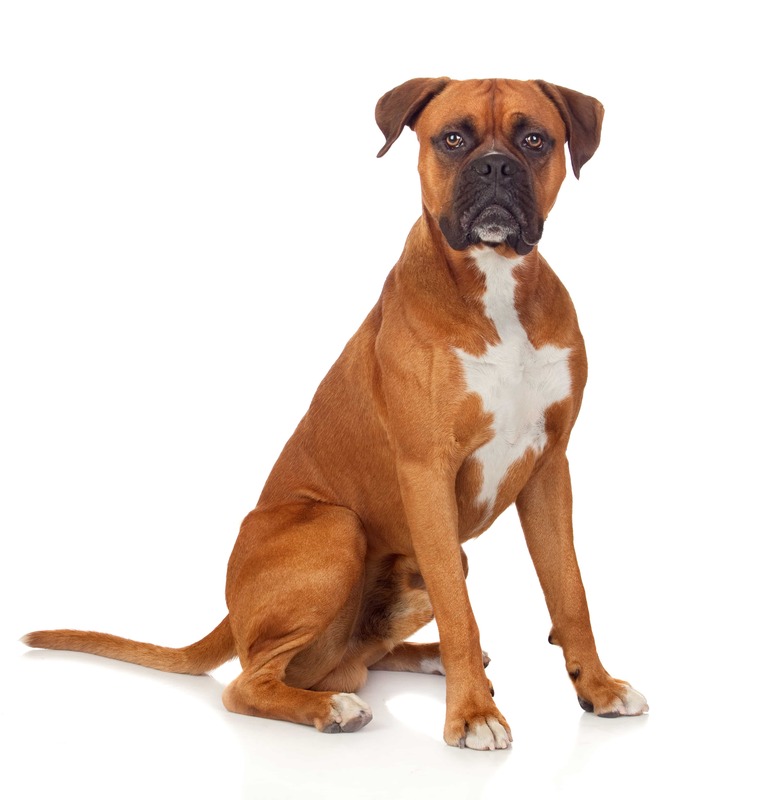 The Boxer is a short-haired breed, with a shiny, smooth coat that lies tight to the body. The recognized colors are fawn and brindle, frequently with a white underbelly and white on the feet. These white markings, called flash, often extend onto the neck or face, and dogs that have these markings are known as “flashy”. Boxers are a bright, energetic and playful breed and tend to be very good with children. They are patient and spirited with children but also protective, making them a popular choice for families. They are active, strong dogs and require adequate exercise to prevent boredom-associated behaviors such as chewing, digging, or licking. Leading health issues to which Boxers are prone include cancers, heart conditions such as aortic stenosis and arrhythmogenic right ventricular cardiomyopathy (the so-called “Boxer cardiomyopathy”), hypothyroidism, hip dysplasia, and degenerative myelopathy and epilepsy; other conditions that may be seen are gastric dilatation volvulus (also known as bloat), intestinal problems, and allergies (although these may be more related to diet than breed).